The Aston Martin Vantage Roadster, previously only available with a V8 engine, will be offered in a limited run with a 517PS 6.0-litre V12 engine. Order books for the new model are open, but you’ll need £150,000 to buy one. The new Roadster is powered by the same engine as is fitted to the V12 Vantage Coupe, and it provides impressive performance. 0-62mph is estimated to take 4.5 seconds, and top speed is likely to be around 190mph, but official testing is yet to take place. In order to cope with the extra power, the chassis has been tweaked and reworked with touches from the V12 Coupe model, including changes to the dampers and springs and aerodynamic modifications to improve traction at the rear of the car. The cabin benefits from some unique touches to differentiate the V12 Roadster from other Vantage models, including glass switches and a selection of carbon-fibre personalisation options. There’s also a Sport button, which sharpens throttle response and provides a more purposeful exhaust note. Standard equipment includes sat-nav, automatic lights and wipers, a tracking device and Bluetooth, but a host of optional extra equipment is offered, along with an array of customisable colours and trims. 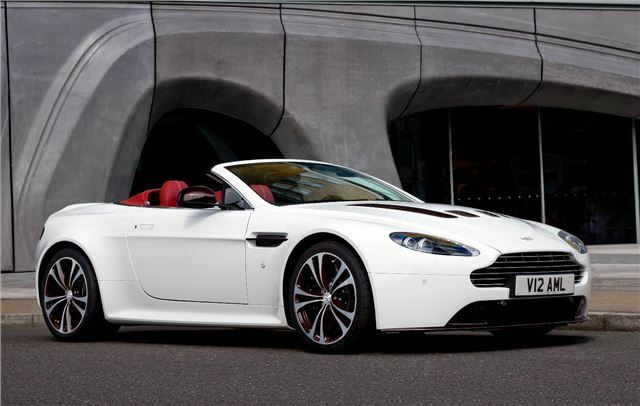 Order books for the V12 Vantage Roadster are open now.